If watching the new president field questions last night made you reflect on the guy who used to be in charge, you may want to check out W., Oliver Stone’s better-than-its-reputation biopic of George W. Bush. 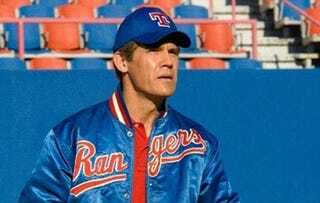 Stone tries too hard to turn famous Bush malapropisms into dialogue, but his recreation of the ex-president’s rise to power is engaging and insightful, and well-acted by Josh Brolin. It’s by no means a great movie, but it should make a diverting video rental. Also in the good-but-not-great category this week: the gripping indie melodrama Frozen River, starring the Oscar-nominated Melissa Leo as a single mother turning to human trafficking in order to pay for a new trailer; and two smartly assembled documentaries about artistic expression, Obscene and The Universe Of Keith Haring. On the other end of the scale, if you're behind on your crushing 2008 disappointments, this week would be a good time to catch up with Spike Lee’s irritatingly simplistic WWII adventure Miracle At St. Anna and Fernando Meirelles’ ridiculously shrieky adaptation of José Saramago’s novel Blindness. Forget economic indicators—the first sign that times had gotten hard was when the movies started sucking.